Fast BlockControl gives you a quick and easy way to control the visibility of any Gutenberg based block. This means you can now open up WordPress to the power of dynamic conditional content. This is huge if you use WordPress to run any type of membership site. But the scope for this goes beyond just membership sites as you will discover. With Fast BlockControl you now have the ability to completely customise your site content based on your user interactions such as link and button clicks or product purchases. With Fast BlockControl installed you will see an option for Fast Tags on each block. 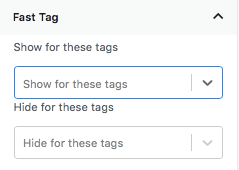 Decide if you want the block to be visible or hidden based on the tags applied to your users. In this case we want to create an access button which is visible to users who have purchased this product. We simply add a button from the block editor, set up the button fields and then apply the Fast Tags to the button block. Now when any user who has those tags visits the page they will see the button to access their purchase. What if we want to change the button when the user buys a different product? Simple! We just edit the button and apply a new tag which will hide it when the user has that new tag. So now this button has 2 conditions. When user purchases product A it will show. If they purchase product B it will be hidden again. Of course we can now add another block with a new button for product B giving them the new access. Or we could simply have 2 buttons using different tags, one for each product. 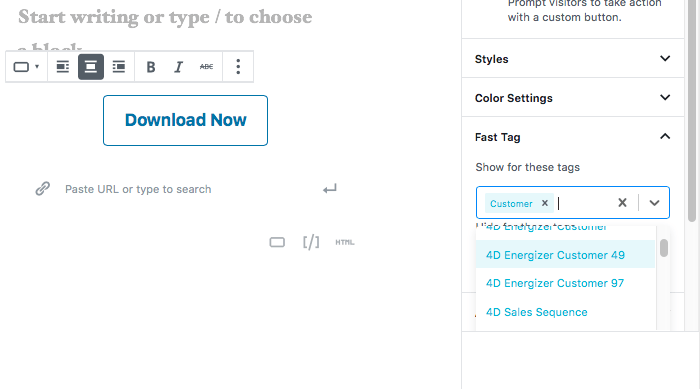 As you can see creating dynamic custom content with WordPress is now as easy as adding tags. 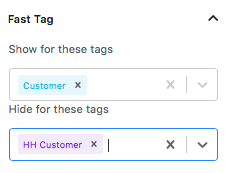 If you want to find out how to add tags to your users, then click here.